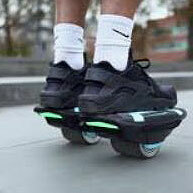 The Zuum self-balancing hover shoes offer a fun and ultra-portable means of personal transport. Designed to be ridden both indoors and out, the Zuum hover shoes feature an auto-balancing design and a top speed of eight miles per hour. Small enough to slip in a backpack, the shoes also boast anti-skid technology to help the rider maintain control as well as being dirt- and splash-resistant. The Zuum shoes offer 1.5 hours of battery life on a single charge, and the batteries are safely contained in a fire-proof enclosure.